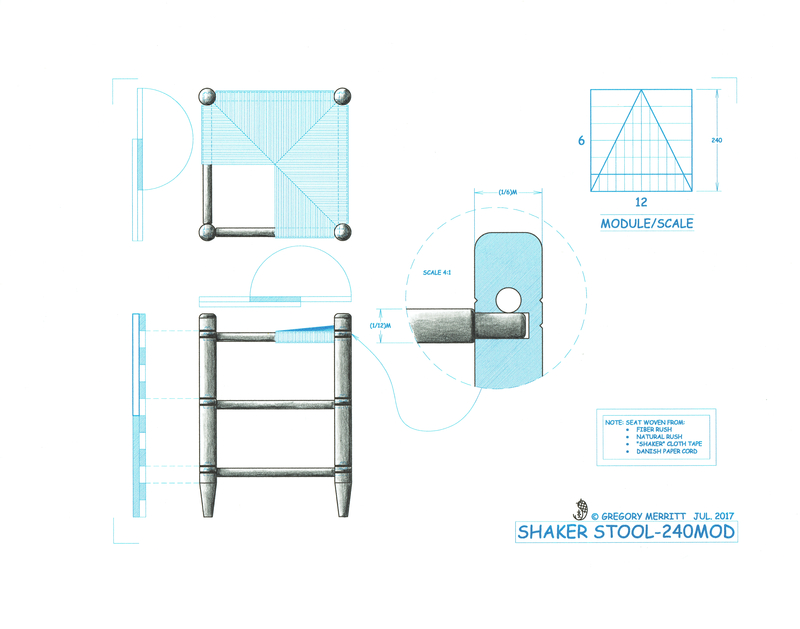 My exploration of seating continues with a couple of Shaker inspired stools. Many, many moons ago, long before GPS, we made a trip to Nashville for a friend’s wedding. We had very little money at the time and knew this would be the only trip for that year. Unfortunately our time in Nashville was less than pleasant, other than the wedding. Anyway, on the trip home we began looking for any stop that would salvage the trip. My wife scanned over the road atlas and stumbled on the Shaker Village of Pleasant Hill just outside of Lexington, KY. So, on a whim, we routed ourselves to the village. We arrived late afternoon on a Saturday and were pleasantly surprised that they had overnight rooms. As luck would have it there was a room available. Not only that, they had a dining hall that served family style meals. So we moved into our room and walked to the dining hall and had a very pleasant dinner by candlelight. The next day we toured the village and I poured over the furniture and buildings as far as they would let me. This was long before I had any tools or even a shop space, but the desire, the desire to build was there. 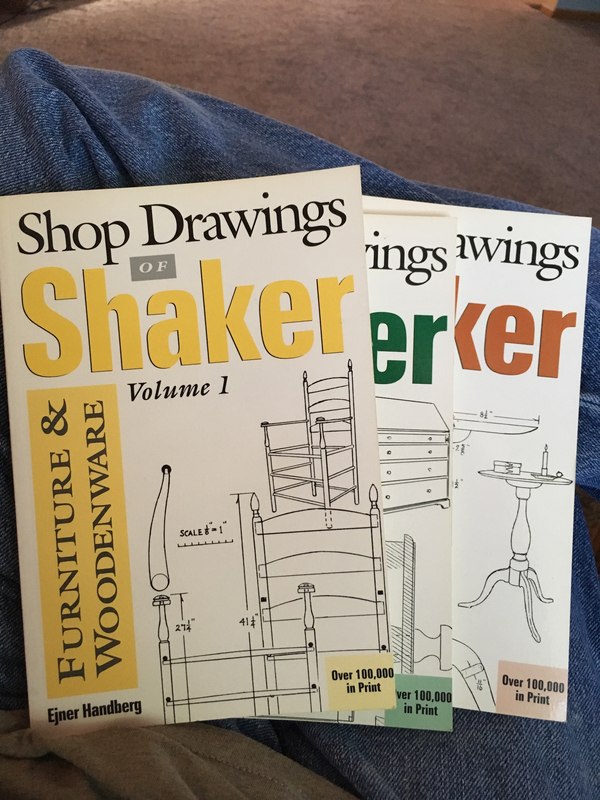 The last stop before leaving the village was the gift shop and there I bought three little books of scaled drawings of Shaker furniture. That’s a bit of back story, but I thumb thru these books every now and again for inspiration. This time around the stools caught my eye. Actually the rocker has my interest, but I figure the stools will be a good way to get my head around the process. These are simple stools and should nestle nicely with the kitchen island that I converted my old workbench into. I like most things Shaker, there is an elegant simplicity in all that they built. The one thing I have never been a fan of though is the woven tape seats. Seats woven with muted earth tones are OK, but the brighter colors just look out of place to me. So my stools will have seats woven with fiber rush. It looks simple to accomplish and I personally like the look. After playing around with the proportions and a little time at the drafting board, here is what I came up with. Not too different from the original Shaker design, just tweaked slightly. I’m building these stools with what I have on hand. 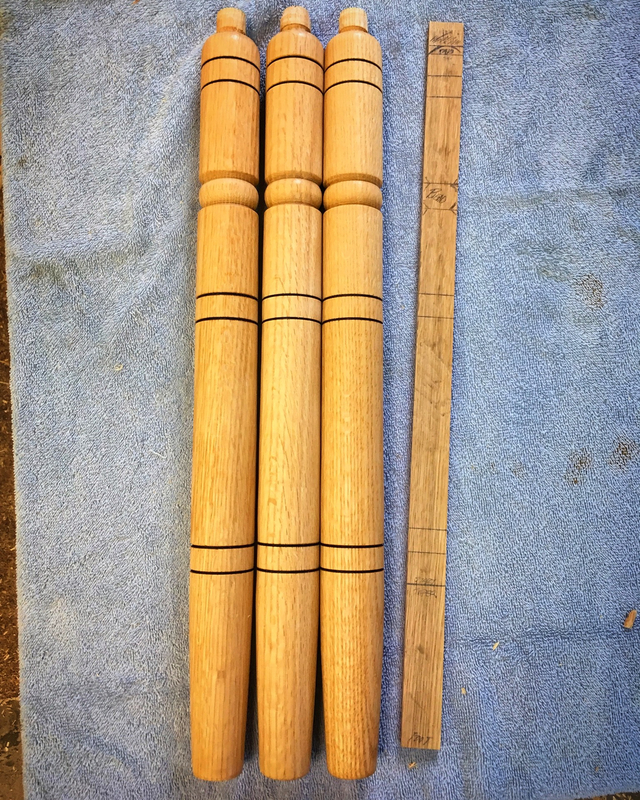 The legs will be red oak and the stretchers will be white oak. The seats will be woven from fiber (paper) rush. I’ve gotten off to start turning the eight required legs. The goal is to crank out one leg after work every evening. So far, so good. I’m three for three. I’m actually getting pretty quick at it. Quick being a relative term. The story stick is a handy thing for this repetitive work too. I deviated from the Shaker simplicity and added a single bead to the leg as well as a little wood burning. You know I can’t not add some wood burning. Just one more reason I would have made a lousy Shaker. This entry was posted in Shaker Stool 240 Mod and tagged bead, red oak, shaker, stool, turned leg, white oak. Bookmark the permalink. Would marking the mortise holes the width of the tenon less 1\16″ or so create inter-locking tenons? Sure would. Assembly and subsequent repairs may be a little tricky though. It is a judgment call and I chose not to use it on this assembly. Although the tenons will be close enough to assert some pressure on each othe nonetheless. Greg, I have never turned wood, but may be moving into a retirement community where the woodshop has a lathe. You keep this tuff on your blog, don’t you? Yep, its all here. I’ve been trying to reorganize it too. I’ve been separating everything into to categories. Have a look in the left hand column. I’ve been fascinated with rush seating for a while (haven’t tried it). I know there are whole books that on “caning” a seat. I’m really looking forward to seeing what you come up with. I don’t know what paper rush is. Can you tell me? I like the look of the simple weave pattern of a rush seat. I’m working on a post to explain what fibre rush is (note the spelling). Until then…fibre rush is a single ply twisted paper cord made to resemble natural rush. It has been in use for chairs for several decades. My upcoming post will delve a little deeper. I have trouble interpreting your drawings to inches. Do you have some clue as to how I can do that?